Partnered Sponsors Beam Suntory, Devils Backbone and Katcef Brothers join Anglers Sports Center and together with all our generous sponsors, the Boatyard offers a day on the water with friends followed by a lively after party! The event really begins at the Captains Party on April 19, 2019, where the official 2019 measuring stick and the awards party tickets are distributed to the Captains with their bags. Anglers enjoy Boatyard burgers, fresh local oysters and ice cold beer while comparing notes and telling fish tales to the sounds of Cuzzin Mark & Sean. Saturday the 20th is the big day, fishing starts at 5:00am. As this is a catch and release event, digital fish photos are submitted to the judging team using iAngler Tournament (or by email or in person). For more details, (including past results and photors), to view the complete Rules and Regulations or to REGISTER, please click here. The After Party (4:00-8:00pm) wraps up the day with great awards (thank you generous sponsors! ), delicious Boatyard grub and libation and live music by the Jess McQuay Band. The party is open to the public and tickets are available at the door. 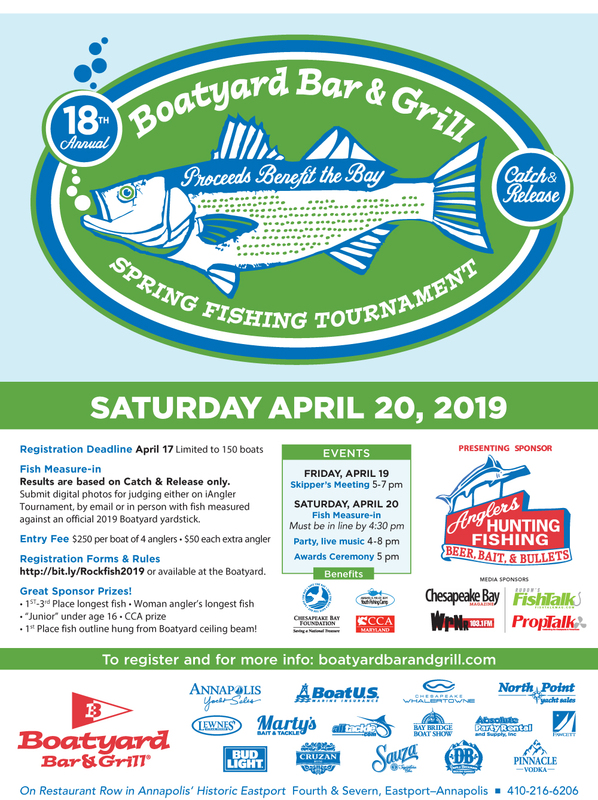 Please join the Boatyard Bar & Grill in its commitment to a healthy bay and join us on April 20! 10 Most Famous Sailors Bars in the World (Sail Universe, 2018) A must-go-to in Maryland, this bar and restaurants is one of the most authentic ones in the world and a perfect spot to get to know some expert and enthusiastic sailors from the Chesapeake Bay.